A man walks past an electronic board showing Japan's Nikkei average outside a brokerage in Tokyo, Japan, November 18, 2016. SYDNEY - Chinese shares climbed on Monday after a week-long break as a disappointing survey on the country’s service sector did little to dent optimism on global growth, while political uncertainty caused turbulence for the Turkish and British currencies. 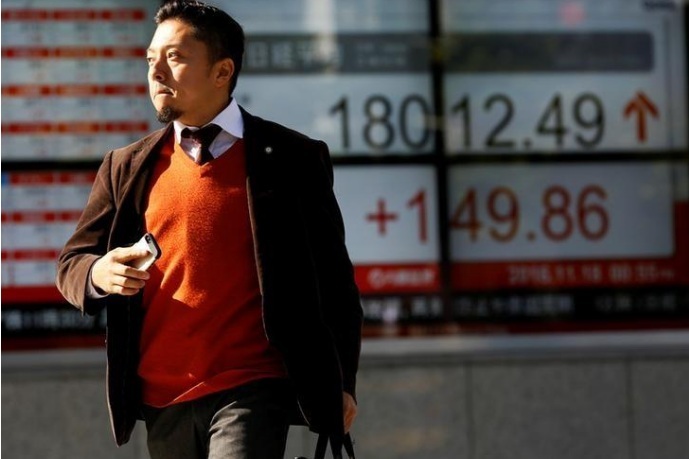 Liquidity was lacking with Japan and South Korea on holiday and a partial holiday in the United States where stocks will be open but bonds will be closed. The Chinese blue-chip CSI300 index rose 1.9 percent to heights not seen since late 2015, partly in a delayed reaction to a targeted easing by the country’s central bank announced a week ago. Not so welcome was a fall in the Caixin index of service sector activity to a 21-month trough of 50.6 in September, a contrast to healthier numbers in manufacturing. Australian stocks still managed to put on 0.7 percent, while Nikkei futures added 0.1 percent even though the cash market was shut. MSCI’s broadest index of Asia-Pacific shares outside Japan edged up 0.1 percent, having rebounded by 1.7 percent last week. E-Mini futures for the S&P 500 were trading 0.15 percent firmer, while futures for the Treasury 10-year note rose 1 tick. Bond yields had initially spiked higher on Friday in reaction to firm U.S. wage numbers, only to retreat as fresh jitters over North Korea bolstered safe havens. Annual growth in average hourly earnings accelerated to a relatively rapid 2.9 percent in September, though that was biased upward by bad weather. The gain outweighed a 33,000 drop in nonfarm payrolls as hurricanes Harvey and Irma left displaced workers temporarily unemployed and delayed hiring. The pick up in wages boosted already high expectations that the U.S. central bank will raise rates at its December meeting, and that further hikes are likely in 2018. Minutes of the Federal Reserve’s last meeting are due on Wednesday and may well show enough support for a move by year end. A host of Fed speeches are also due this week. In currency markets, the dollar was a shade softer at 93.760 against a basket of competitors. It also edged down to 112.60 yen, having been as high as 113.43 on Friday. The euro was a fraction firmer at $1.1741, aided by TV pictures of hundreds of thousands of people in Catalonia’s capital Barcelona demonstrating against moves to declare independence from Spain. Catalan leader Carles Puigdemont is expected to address the region’s parliament on Tuesday, when he could unilaterally declare independence. Another early mover was the Turkish lira, where the dollar surged 4 percent at one point to the highest in seven months amid a diplomatic spat with Washington. The U.S. mission in Turkey and subsequently Turkish mission in Washington mutually reduced visa services after a U.S. mission employee was detained in Turkey last week. The pound had popped higher on reports British Prime Minister Theresa May could sack Foreign Secretary Boris Johnson as she tries to reassert her authority after a series of political disasters. Sterling had been undermined by speculation that May herself could be ousted ahead of crucial Brexit talks between Britain and the EU. The initial spike could not be maintained, however, and the pound soon steadied around $1.3080. The New Zealand dollar hit a four-month low on Monday after a final vote count in the country’s tight general election released over the weekend failed to identify a clear winner. In commodity markets, gold gained 0.4 percent to $1,280.61 an ounce and off a two-month low touched on Friday. Brent futures gained 13 cents to $55.75 a barrel, while U.S. crude rose 16 cents to $49.45. Chinese shares climbed on Monday after a week-long break as a disappointing survey on the country’s service sector did little to dent optimism on global growth, while political uncertainty caused turbulence for the Turkish and British currencies.